I would like you to Meet Marianne McHugh. 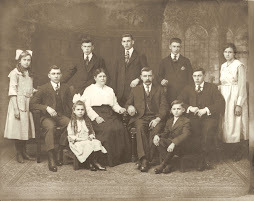 Marianne was born 29 Nov 1930 in Nanticoke, Luzerne County, PA. She was the oldest surviving child of Joseph Dennis McHugh and Mary (Hodick) McHugh. She was born with Down Syndrome in a time when children born with Down Syndrome were quite often put in institutions to live their lives with little contact with the outside world. There wasn’t much hope for children born with Down Syndrome. Marianne’s parents were told to lock her up, she’d never accomplish anything. They refused. They kept her home and raised her as their own. She didn’t go to school; that sort of thing didn’t happen to children with Down Syndrome in the 1930’s. But if there was a family gathering, she was there. Even if it was at the local park, or a store, or a restaurant. If the family was there, Marianne was too. If her younger brother and sister had friends over, they stopped to say hi to Marianne too. She was loved by everyone in the family-- a favorite of her elders and her peers alike. Marianne McHugh had a pretty good life for someone with Down Syndrome born in 1930. 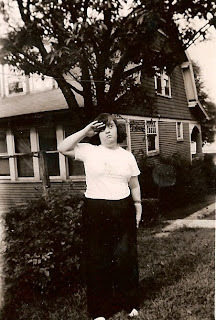 Marianne McHugh died 28 April 1978 in West Seneca, Erie County, New York. She was 48 years old. A very good life span for someone with Down Syndrome born in 1930. Marianne was my father’s oldest sister. Though there are many ancestors I wish I’d known, she is the one I wish I’d known better. I was thirteen years old when she died. But I have thought of her many times since, especially in my adult years as I work with children with special needs. I often wonder what kind of life she would have had, had she been born in my era and not her own. She would have gone to school. She might have participated in Special Olympics. She might even have been able to live independently with supports to assist when needed. Children and adults with Down Syndrome today have so much more working for them than Marianne ever had. 93 percent of the children and adults receiving state-only services - more than 4,000 individuals - will lose all of their services such as therapies, habilitation, employment supports, after school and summer programs, attendant care, respite and transportation. Effective March 1, the Department will reduce rates for 850 agency and 3,500 independent providers of home and community-based (HCBS), institutional, and acute services by 10 percent. Since fiscal year 2005, HCBS rates have increased by about 22 percent. In addition, the Department will to address group-home capacity issues and lower enhanced rates for specialized habilitation-communication, specialized habilitation-music, community protection, behavioral health, and day treatment and training. To summarize, effective March 1, over 4,000 individuals with developmental disabilities will lose physical, speech and occupational therapy – therapies that help them overcome problems that they did not ask for, but that their disorders gave to them. 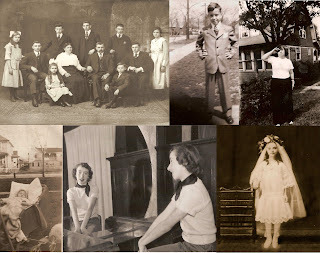 Therapies that help them live as much like you and me as possible; something Marianne could never have aspired to, thanks to her being born in 1930. Thank you, Congress, for wiping out 79 years of progress for people with developmental disabilities. Note to my blogging friends and readers: Yes, I did send this to my legislators. 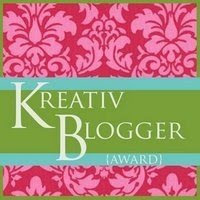 Judy at Genealogy Traces awarded me the Kreativ Blogger Award! I'm always thrilled when people enjoy what I write, even when I'm not as consistent as I'd like to be! Now I'm to nominate 7 blogs, linking them here and commenting on their blogs to let them know. Unfortunately my computer's so slow these days it takes a long time to do 7 so let's see if I can find a few new blogs tonight! 4. Laura, a new blogger at Root Seek. Keep up the great writing and researching! I have a special announcement for all of my geneablogging friends, my non-blogging friends, my readers and anyone else who stumbles across this post. Most of you are aware that I am fanatical about my dog, Izzie. So fanatical, in fact, that he has his own blog. I’m a fan of dogs, and hate to see any animal suffering. The economy of late has been, as we all know, rather tight lately. People are losing their jobs, their homes, and quite possibly, losing weight as they struggle to keep food on their tables. Thankfully, there are food programs to assist with the latter for many families. The same is not always true of our pets. Dogs and cats are being abandoned or surrendered at alarming rates. Often, it’s foreclosures that do the pets in. Often, it’s simply the cost of providing for them. A 2007-08 survey by the American Pet Products Manufacturing Association estimated basic annual expenses for dog ownership run $1,425, and cat ownership $990. (Maryland Newsline Business, http://www.newsline.umd.edu/business/specialreports/foreclosures/foreclosurepets102408.htm). Many, if not most, animal shelters try to provide struggling families with emergency supplies of food if it means the difference between one more pet "in custody" and maintaining a pet’s home. But many, if not most, animal shelters use donated food to feed the pets in their care and cannot meet every need for every family. Tucson is lucky. There are a couple of food programs to assist with feeding pets when families are struggling. I am lucky, as well, to have an opportunity to help feed Tucson’s pets. The Hermitage Cat Shelter in Tucson has been around for over 30 years, and one of their programs is called Food For People’s Pets. Its aim is to provide some relief to families who struggle to feed their pets (cats and dogs), in hopes that the families will be able to keep the pets as opposed to surrendering, or worse, abandoning, them. This program is in need of some re-vamping, and I hope to work with the shelter’s staff to do just that. There is now a blog dedicated to the Food For People’s Pets program. I hope to make it a place for people to learn about pet nutrition, the prevalence of animal hunger, solutions to the problem, events of the program, and spotlights of the program sponsors. While hunger in animals will be addressed, it will be done so in a respectful, family-friendly manner; no “shock and awe” tactics such as graphic photographs will be used. Please, bookmark the blog at http://www.feedingpeoplespets.blogspot.com/ and visit often. It’s just getting off the ground, but I want to make it a true showcase for the good that people’s donations do. I also, admittedly, hope to make it an accessible way to donate to the program. Towards this end there is a link on the blog page to the “Network For Good” badge that is assigned to The Hermitage Cat Shelter. From this badge, one can designate donations to the Food For People’s Pets program. I also have this link on my other blogs and here, so please, if you can, donate $5 to the program. Or donate a bag of pet food to a program in your area if you have one. I would be crushed if I had to surrender Izzie for lack of food, and I hate to think of something so simple being so far out of reach for pet owners everywhere. Thanks for listening. I now return you to your regular programming. The 66th edition of the Carnival of Genealogy is the annual iGene Awards! This is where I get to choose my best posts in the following categories of Best Documentary, Best Biography, Best Comedy, Best Screen Play and Best Picture. I'll start with the Best Documentary. I chose an article I posted in early November that recognized not one of my family, but a friend of mine's family. In "A New Branch Sprouted" I announced the proclamation of Nan Qi Qing of Guandong Province, China as the daughter of Joe and Donna of Chandler Arizona. I chose this article because the announcement was the culmination of almost three years of waiting for these parents. Today I'm pleased to announce that Lauren Elizabeth has been home almost one month, and though the first few days with Joe and Donna in China were incredibly rough for her, she is already a blossoming 22 month old, beautiful toddler. Best Comedy: Blog Takeover, which featured Izzie posting his own ancestry. "Who-Cuddn't Luv-a-that FACE?" Best Screenplay: "So Many Ancestors". It would be so cool to see a film on my meeting the four ancestors I'd chosen for the COG of January 28, 2008. I would get Janeane Garofalo to portray me. I loved her in The Truth About Cats and Dogs. She'd have to dye her hair a bit lighter though. For Margaret Doyle I'd have Helen Hunt. Helen's character in Castaway knew what it's like to literally lose a loved one, and so I'd want her to play Margaret (who is nowhere to be found in the 1880 U.S. Census) as a chance to turn the tables and portray the one that GOT lost. Along those same lines, I'd choose William Petersen of CSI to portray my great-grandfather James O'Rourke. Since William's character Gil is used to solving mysteries, perhaps he'd be good as the mysterious one instead, and the culmination of his performance would be the revelation of who James' parents were since I can't figure it out! Besides, Ann Donahue is one of the creators of CSI. Maybe she'll turn out to be connected through my maternal Donahue line. For my great-grandmother Mary Griffin, I'd get Betty White simply because she cracks me up. Finally, for my paternal great-grandmother (on my dad's maternal side) I'd ask Camryn Mannheim. I think she's a great actress, and she kind of has Justina's smirky grin :). And now, the moment you've all been waiting for: Best Picture. Well, what did you expect? I couldn't come up with just one photograph for footnoteMaven's 4th edition of Smile for the Camera. Did you expect me to come up with just one for the iGene Awards? 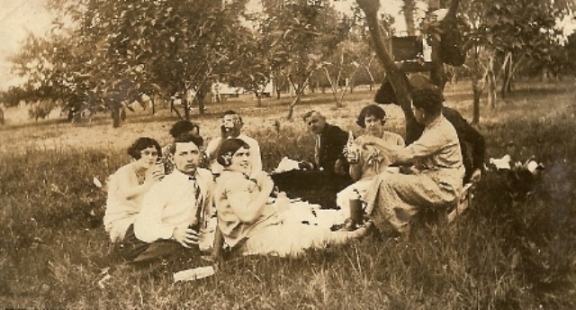 Though if I was forced to I would probably choose the photo I use for this blog's header, since it is probably the oldest photograph I have of the Doyle family (Thanks, Mike for sending it to me!). The Geneablogger cookbook is HERE! Thirty Five recipes from Eighteen geneabloggers! Wow. What a feat. It is available via download at THIS SITE! It is in .pdf format so you will need the Acrobat Reader to view it. You can choose to print it up yourself, copy it to disc and have a copy place print and bind it, or use an online service such as lulu.com to upload it, print it, bind it, and ship it. This wound up being a bigger project than I had imagined, and I enlisted the help of a few geneabloggers to assist. Special thanks to Julie Cahill Tar, footnoteMaven, and Thomas MacEntee for their assistance with editing, graphic design, and technical guru. I hope you enjoy the submissions, the photos, the stories, and of course, the recipes. I can tell you I've already tried one and it was delicious. Randy Seaver of Genea-Musings posed another Saturday Night Fun challenge for all geneabloggers. It's been a while since I partook in this activity, and though it's not Sunday, the alliterative theme can still work. Randy asked us to open our "My Pictures" folder, and open the 6th folder continuously until we run out of folders and have a series of photographs. 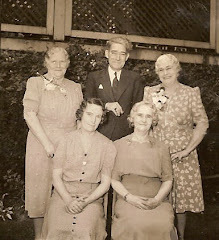 We are then to choose the 6th photograph and post it with any known details. As luck would have it, my photo is one I think is a virgin post for me: I don't think I've posted it before! And it's an old photograph, too! I so wish this photo was better in quality. I'm not sure, but I think the man in the front passenger seat is my father's maternal grandfather Edward HODICK. The other subjects are pretty blurred, and I can't recognize them just yet. 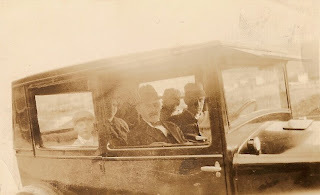 However, my working presumption is that the man in the passenger seat (front) is Edward HODICK and the driver is his son John. 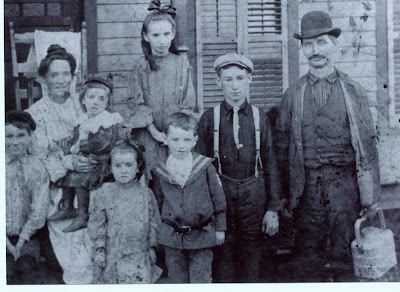 I'm going to further presume that the boy in the back (passenger side) is Edward HODICK Jr., since he was quite a bit younger than most of his siblings. I do not know who the woman beside this boy is and certainly cannot make out the man in the driver's side rear seat.